Today, September 21st, the International Banana Festival was celebrated in Fulton, Kentucky, which is about a four-hour drive away from me, so I was unable to make it, with the husband’s work schedule and the girls being in school. But I wanted to celebrate by cooking with bananas today, anyway, since we all love them so much at our house. 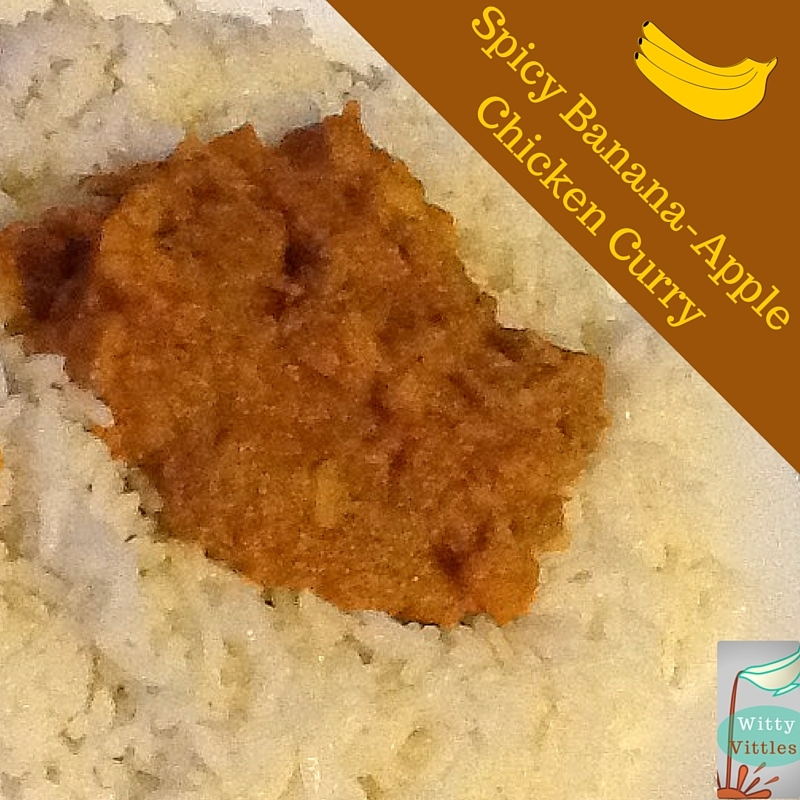 And, since we’re still in National Chicken Month, I thought it would be fun to combine chicken and bananas, but I was drawing a blank until I did a Google search and ran across the idea of making a chicken curry with bananas. I used my go-to chicken curry recipe as the base and ran with it, taking a few ideas here and there from banana curry recipes I found online. The apples were an afterthought because I had a few sitting around that were about to go bad, but they turned out to be a wonderful addition. Part sweet-and-sour chicken, part authentic Indian curry, this deliciously sweet curry sauce is a unique way to use up leftover crock pot chicken. Spray a large saucepan with Pam cooking spray. Stir together the chicken, onion powder, garlic powder, coriander, ginger, tomato sauce, salt, cardamom, turmeric, cumin curry powders, red and black pepper, and nutmeg. Cook over low heat for about 5-10 minutes. Slice bananas and dice apples and add to the saucepan. Stir in the brown sugar and Greek yogurt until thoroughly blended. Simmer, covered, for about 20 minutes, stirring frequently. Serve immediately with cooked jasmine rice. Since my husband and I were so used to eating the other type of curry, this sweet version came as a bit of a surprise, but we both found that once we crossed over the “curry hurdle,” we both really enjoyed this dish. The girls, not surprisingly, wouldn’t even touch it, but that was okay because it left more for the grown-ups. It’s another winner to add to the “blah-buster leftover chicken recipes” category!